Lilia, by Ekaterina Lukasheva. I’m not sure I got the name right, but I’m absolutely sure about the author. In the past year I’ve been dabbling a lot into other kinds of origami, such as traditional origami, tessellations, and minimalist designs. But still, it’s good to make some modular origami models. 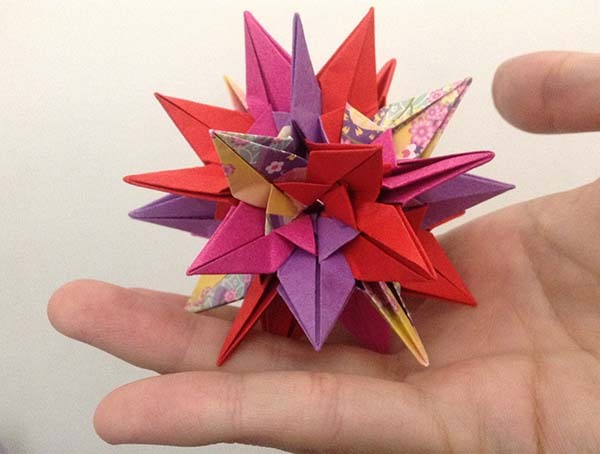 This is a kusudama model of very standard design. 30 units, 5 colors arranged symmetrically. Although, I actually made 2 of the 5 colors identical, which is a cheeky way of making it slightly asymmetrical. This was made as a gift for a relative.